Protected Bicycle Lanes at Risk on Madison Ave. 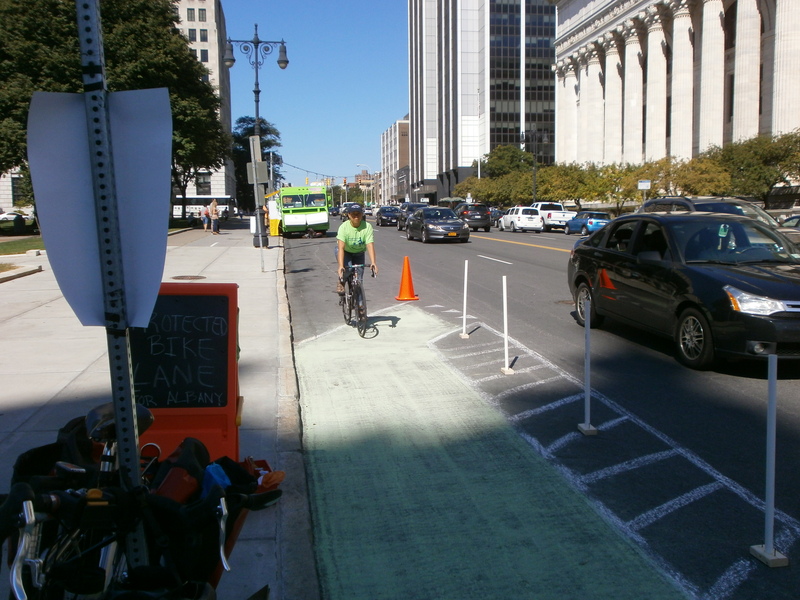 Protected Bicycle Lanes at Risk on Madison Ave. – After a 10-year effort by citizen groups, the City of Albany is designing and constructing a “road diet” along Madison Ave. from S. Allen St. to Lark St. While the project reduces the number of motor vehicle travel lanes, while improving to some degree bicycle accommodations, it still maintains Madison Ave. as a car-priority street. The City of Albany is holding a Public Meeting on Madison Ave. Traffic Calming and Protected Bicycle Lanes on Wednesday, March 9, 6:30-7:30 PM at the College of St. Rose, Lally School of Education, 1009 Madison Ave. Since no one of these, especially the first two “non-facilities,” were acceptable, the Protected Bicycle Lane Coalition formed to push for a 2-way Protected Bicycle Lane on the north side of Madison Ave. The city studied this proposal and added a fifth option, Buffered Bicycle Lanes. The Protected Bicycle Lane Coalition then offered a second Protected Bicycle Lane option, 1-way Protected Bicycle Lanes on each side of the street. The City now has two alternatives under consideration. The purpose of the meeting is to review these concepts and trade-offs for the two feasible alternatives. The Allen St.-to-Lark St. project is to be done in three phases, Allen to Partridge Sts. being the first. Parking Day in the City of Albany ~ PBLs Forever! 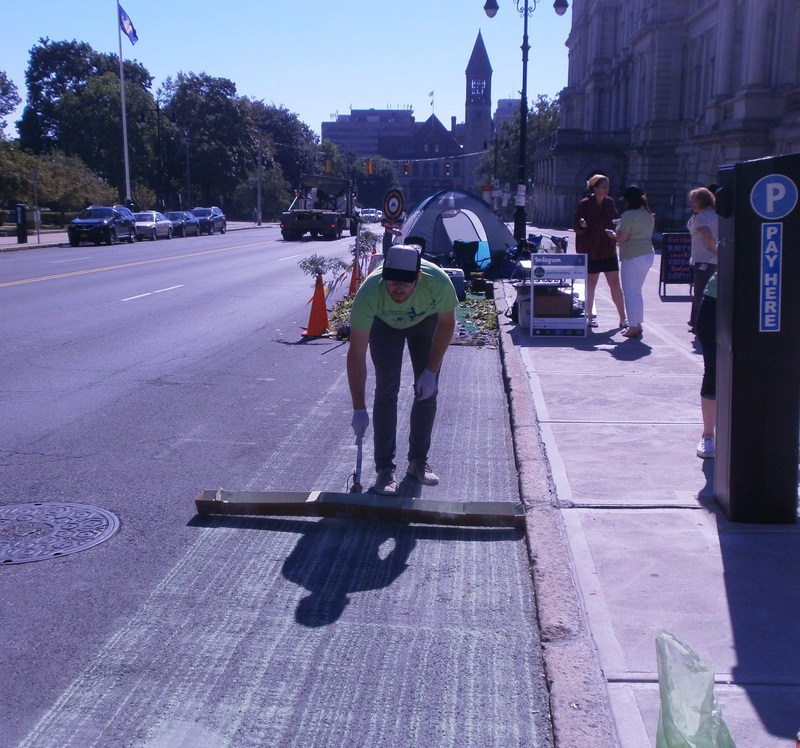 The Protected Bicycle Lane Coalition and Albany Bicycle Coalition coordinated on a Protected Bicycle Lanes demonstration project as part of “Parking Day” in the City of Albany. 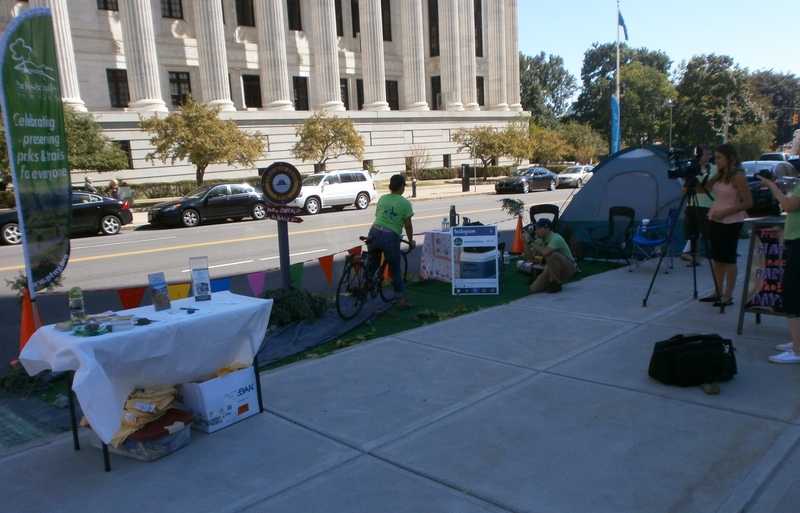 Our exhibit was coordinated with Parks & Trails New York that had a campsite set up just at the end of the PBL green lane. This suggests that acceptable in-city facilities for people on bicycles will enhance there access to parks and trails that surround our urban areas. PTNY was also promoting its “Close the Gaps” initiative to have all on-road portions of the Erie Canalway Trail replace by trails for by the time of the bicentennial of the beginning of Erie Canal construction – July 4, 2017. “Parking Day” is to illustrate alternative uses for street space – uses other than as a tax-subsidized, frequently free place for people to store their motor vehicles. 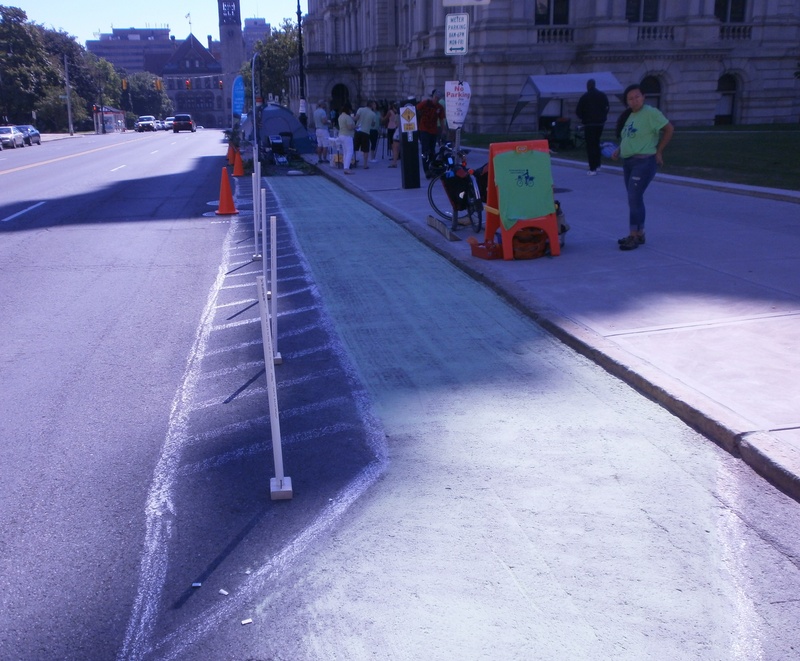 Thanks to Jim’s inventive genius and Rossana’s artistry with sidewalk chalk, ABC+PBLC had a credible full-scale Protected Bicycle Lane demonstration project on Washington Ave. on Parking Day, 9/18/15. From 11 AM until around 3:30 PM, Claire, Jim, and Rossana were on duty to greet the visitors and explain how PBLs “work.” We were impressed with the number of positive comments – “way to go,” “I agree with this,” “good idea,” “when are we going to have these in Albany,” and so on from the many passersby. We also noted several questions about the new Albany County Helderberg-Hudson Rail Trail and how it will be accessed from Delmar, Voorheesville, and Albany. #1 – Jim demonstrating his “Mark I – Corn Starch Lane Builder.” We experimented with different exit hole sizes in the trough. Several passes were need followed by a gentle brooming to get the material spread evenly and into the surface depressions. #2 – The full lane covering three parking spaces of about 20 ft each. #3 – Rossana tries out the PBL – so secure that she felt no need for a helmet. Note entryway. The lane is “NATCO-regulation” 5 ft wide with a 3 ft buffer consisting of paint (chalk) and PVC delimiters. (As a result, we are just outside the 7 ft. Albany standard parking lane. #4 – After a relaxed, safe ride, Rossana arrives at her camping place, courtesy of Parks & Trails New York and just in time for the ever-vigilant Time Warner Cable News reporter to record this first-time event in Albany.